In the typical configuration the incident illumination hits the diffuser on the patterned side of the substrate. This is particularly important for the large angle diffusers to reduce the effects of total internal reflection and allows the diffuser to work as intended. Incidence from the flat side is possible if the scatter angles are sufficiently small. Figure 1 Simple diffuser application Shown is a beam of light incident on the patterned side of the Engineered Diffuser™. Light is refracted at the surface into the substrate. Upon exiting the substrate the light refracts at the planar surface achieving the designed angular spectrum. Also note that the incident illumination should be collimated to achieve the best results, especially when the diffuser output contains sharp features. As one deviates from a collimated state, sharp scatter features start to smear out. Figure 2 Sharp spatial cutoff illumination system. The diffuser is placed near the pupil of the lens system following the lens. In an alternate configuration the diffuser comes before the lens. At the focal plane, however, the image is independent of the particular configuration. So, for instance, if the Engineered Diffuser ™ produces a square pattern, the square will be observed whether the diffuser is placed before or after the lens and independently of the lens’ numerical aperture. This configuration is useful if one needs to control the image size with a single diffuser, which can be done by simply moving the diffuser to set a desired image size. Figure 3 Sharp spatial cutoff illumination system with controlled image size. The lens focuses at the illumination plane and the diffuser is placed between the lens and the illumination plane. Figure 4 Telecentric illumination system with Engineered Diffuser ™ The diffuser is placed at the front focal plane of a lens system. 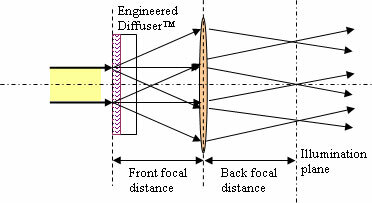 The lens collimates the output of the diffuser and delivers light to the back focal plane with all the ray bundles parallel to the optical axis. Small collimated illumination beam is depicted. Increasing the aperture of the incident light increases the illumination angle of the light at the illumination plane. This effect is shown in Fig. 5. Figure 5 Telecentric illumination system with Engineered Diffuser ™ Finite collimated illumination beam is depicted. The figure illustrates three individual field angles. One axial and two other extreme collimated ray bundles are shown leaving the diffuser and forming sharp features at the back focus of the lens.